April 19: Frederick Augustus Ashford was born to Thomas and Jane Ashford. November 7: The U.S. Federal Census enumerated in Lawrence County, AL showed 20-year-old F.A. (Frederick) living with his parents and siblings. Frederick’s father, Thomas, was a farmer with extensive real estate and 48 slaves. July 11: The U.S. Federal Census enumerated in Elm, Caldwell County, MO showed F. Ashford, a carpenter, living with a Whitford family. July 18: Frederick enlisted in the C.S. Army in Courtland, AL. He mustered into Co. B 16 AL Infantry as a Captain. June 17: Frederick was promoted to Major. October 7: Frederick was promoted to Lt. Colonel. March 26: Frederick was promoted to Colonel. November 30: Frederick was killed in action at the Battle of Franklin. (McGavock Confederate Cemetery, Section 69 AL, Grave 16) Frederick’s brother Alva was Colonel of the 35 AL Infantry, also engaged at Franklin. Alva survived the battle and lived until 1904. April 28: The Moulton Advertiser, Moulton, AL. 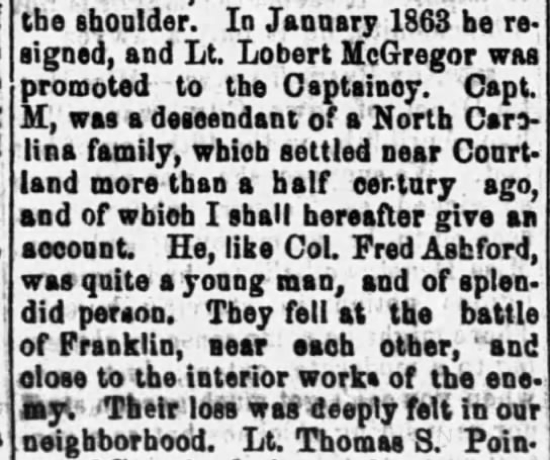 An excerpt about Frederick’s death appeared in the newspaper.